Semana Santa is Mexico's second most important holiday season of the year, behind only Christmas, and runs from Palm Sunday to Easter Sunday. In addition to attending Mass on Good Friday and Easter Sunday, many Mexicans will also take advantage of the holiday to go on vacation. If you're planning to visit Mexico during Semana Santa, make sure you checked on availability in advance. Semana Santa 2018 is April 14th - 20th. 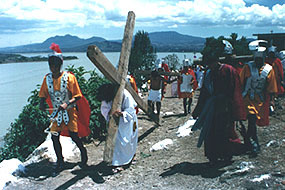 Semana Santa, or Holy Week, celebrates the Christian holiday of Easter. Mexico is nearly 90 percent Catholic, so this religious holiday takes on a special meaning that the entire community shares and participates in. All of Mexico celebrates Semana Santa, but certain cities and villages are better known for celebrating the holiday, and often provide reenactments of the events leading up to Christ's crucifixion on the cross. The best known cities are Ixtapalapa (in Mexico City), Patzcuaro, San Cristobal de las Casas (Chiapas), and Taxco. Smaller and silent torch lit processions, Procession del Silencio, also take place in Aguascalientes and San Luis Potosi. Each community celebrates the holiday with it's own regional flavor, however, popular with the whole country is the breaking of cascarones, colored egg shells filled with confetti, over friends and family. Churches will be filled with those attending Mass on Good Friday and Easter Sunday, and families will take this opportunity to be together. The most moving event of Semana Santa is the reenactment of the Passion of Christ, or the Passion Play. The event's in the mentioned cities are sponsored by religious or community groups, and can include large processions of penitents, sometimes on their knees, a portrayal of the last supper and the crucifixion itself. In many cities, important religious images from the church will be displayed, traditional altars are decorated at home and in the streets, and flower decorations and palm crosses will be found everywhere. The central colonial cities seem to celebrate this holiday with the most reverence and tradition, and if you wish to see the beauty of traditional Mexico, Semana Santa would be well worth seeing for yourself.